Wow I have a treat for YOU! 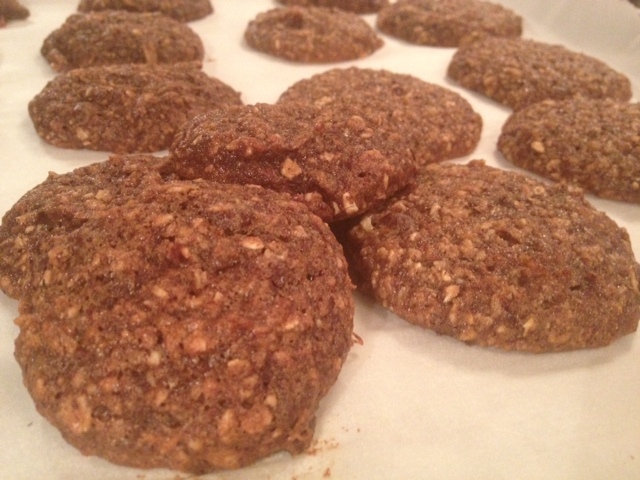 My friend Rochelle sent me a recipe for healthy oatmeal chocolate chip cookies. She said they were some of the best oatmeal cookies she’s ever had so I had to give it a try! You can see the original recipe at www.recipegirl.com. I made 3 changes to this recipe to clean it up even a little more. In the original recipe you’ll see that it calls for brown sugar which I have swapped out for honey, whole wheat flour which I swapped out for gluten free flour, and chopped dates which I swapped out for date butter which makes these cookies super clean without compromising on the taste!! Place butter in cup and microwave until melted. Add honey to hot butter and mix well. Put the oats in a blender, vitamix or food processor and blend until it becomes a powdery consistency. Place all dry ingredients into a separate bowl and mix. Once dry ingredients are mixed, add in honey and butter as well as vanilla and the egg. Put chocolate chips in a blender for food processor to brake them up a little. Not so much that they become a powder. You can also just chop them with a knife. Once they are broken up, add them to the mixture. Spoon onto the cookie sheet and bake for 15 minutes. You may want to only keep out a few and throw the rest directly in the freezer because I promise you; you will have trouble NOT eating the entire tray!! If you look under “recipes” on my blog you can also find the date butter recipe that way. Basically it’s dates and spices blended together. You can add it to almost any baked goods in replace of sugar. It is super sweet and a really healthy alternative to sugar. It’s really easy to make too! !